Pro Kabaddi League Season 6 will commence from the 7th of October 2018 as the teams gear themselves for a long, gruelling season up ahead. Twelve franchises of the league will battle it out on the mat over the duration of three months as the Pro Kabaddi League will kickstart with the Chennai leg at the Jawaharlal Nehru Stadium and conclude at the NSCI Dome in Mumbai, Maharashtra on January 5, 2019, where the champions will be crowned in the grand finale. UP Yoddha was one of the four debuting franchises last season and played their home leg at the Babu Banarasi Das Indoor Stadium in Lucknow, Uttar Pradesh. The team made a big splash in last year's auction when they signed all-rounder Nitin Tomar for a then-record price of 93 Lakhs. They further added steel to their lineup picking Rishank Devadiga as the duo put on stellar performances throughout the season and led the side all the way to the playoff stages in their first season in the league. 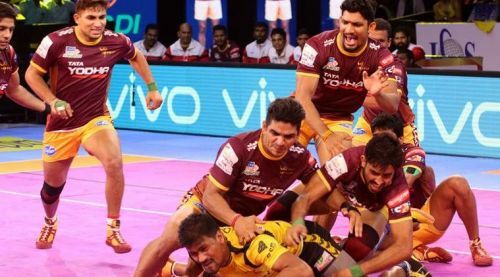 Going into the sixth season, the UP Yoddha have built a well-balanced squad from the Pro Kabaddi League 2018 auction. They lost out Nitin Tomar to the Puneri Paltan but have signed Rishank Devadiga for a price of 1.11 Crores making him the lead raider for the side. The Yoddhas have added more raiding firepower to their squad this season when they picked up former Haryana Steeler Prashanth Kumar Rai and U Mumba man Shrikant Jadhav who had impressed last season with their performances on the mat. Veteran defender Jeeva Kumar will spearhead the defensive lineup for the UP Yoddha franchise along with the youngsters in the roster like Nitesh Kumar, Pankaj and Sagar Krishna who will get a chance to make their mark this season again. We take a look at a few reasons why the UP Yoddha can step up and challenge for the title in their second season in the Pro Kabaddi League. GMR League Games Pvt Ltd-owned UP Yoddha, in their two seasons in the Pro Kabaddi League have always stepped it up at the auctions. In their debut season, they made huge waves with Nitin Tomar's signing for 93 Lakhs which was the highest buy at last year's auction. They did not use the priority pick option last year and utilized the funds to grab Nitin Tomar and Rishank Devadiga in the auction last season. This year as well, they played it smart in the auction and picked up good signings using their purse well. Shrikant Jadhav, Prashanth Kumar Rai and Rishank Devadiga cost them over 2 crores in total but they will spearhead the raiding and will ultimately end up giving them the dividends in form of glory in the league.